The Alaska Dispatch News reports Edward Itta, a prominent North Slope leader, died Sunday of cancer. Itta was mayor of the North Slope Borough from 2005 to 2011, when Shell was seeking oil leases and permits for offshore Arctic development. Edward Itta in 2009 testifying before Department of Interior Secretary Ken Salazar. Author Bob Reiss featured Itta is his book "The Eskimo and the Oil Man; The Battle at the Top of the World for America's Future." In a talk on stage with Itta at the 2012 Arctic Imperative Summit in Girdwood, Reiss likened the opening of the Arctic to historic struggles for control of the Middle East. Reiss said opening the Arctic raises questions about international borders, international jurisdiction, free maritime passage, and more. Itta got the Borough a seat at the table with federal regulators and Shell. He forged agreements to halt operations during whale migrations, and to get oil moved through the TransAlaska Pipeline rather than tankers. He pushed for a stronger Coast Guard presence, more scientific research, and better regulation of marine transportation. But Itta said looking back on his life spent "chasing whales and caribou, and fishing," he thought of Sitting Bull's refusal to sign a treaty giving up his people's homelands. Itta said he too, at heart, was a traditional man. “I am Edward Saggan Itta, an Inupiat Eskimo, a hunter and a whaler and like Sitting Bull, I'm not gonna go to that reservation,” said Itta. Itta served in a number of leadership roles. He was a member of the U.S. Arctic Research Commission, and past president of the Inuit Circumpolar Council-Alaska. 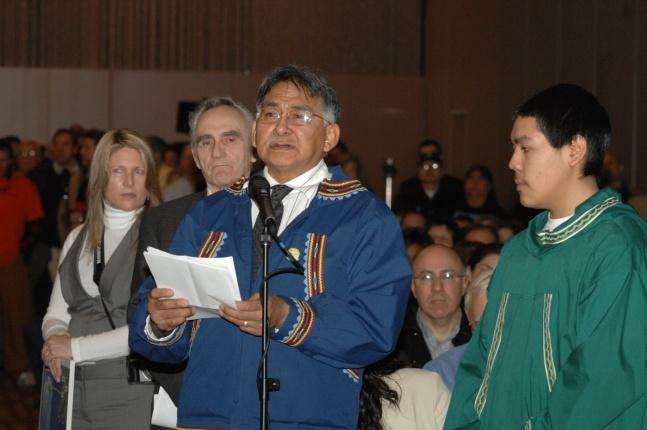 He headed or served on the Outer Continental Shelf Policy Committee, Barrow Whaling Captains Association, and Alaska Eskimo Whaling Commission as well as the North Slope School Board, and the federal Subsistence Advisory Council for Northern Alaska.